Call us today for dog grooming services! Are you searching for trustworthy dog boarding services in the Fairfield, CT and Westport, CT? Does your furry friend need quality dog grooming services? The professionals at Town House For Dogs And Cats LLC is the dog kennel that can give you peace of mind. Give us a call today for more information! If other dog boarding facilities have disappointed you in the past, you need a change of pace. You need to book your dog at a dog kennel that is attentive and compassionate. Where can you find a dog boarding center that meets your care qualifications? When you're located in Westport, CT and Fairfield, CT, you should always bring your dog to Town House For Dogs And Cats LLC. We accept primarily dogs and cats but we are open to the more exotic types, such as birds, rabbits and hamsters. All you need to get started with our dog boarding kennel is proof of current vaccination. If your pet needs to be groomed or needs a day of pampering or relaxation call Town House for Dogs and Cats LLC today. Pets should be groomed often to keep their coats looking fresh and healthy. Stop in at Town House for Dogs and Cats LLC today, you will not be disappointed with our pet and dog grooming service or our great staff. All staff members treat every pet with special care so they feel like they’re staying in an extravagant Country Club. The pet and dog kennel offers personalized attention to all pets so they feel comfortable, loved, and secure at all times. As soon as your pet arrives, he/she will feel instantly welcome in the facility’s warm, cheerful, and immaculate environment. Acknowledging that your pet is your best friend and deserves continual companionship and care when they are away from you, the trained staff is friendly, caring, and strives to maintain your pet’s daily routine. They lavish lots of attention on your pet with petting, hugging, and tasty treats. Our dog boarding center offers a gourmet menu. While you're away, your furry friend should still be happy and with help from out dog boarding services, that is possible. We offer a gourmet meal including "Smothered Comfort" and "Grammy's Pot Pie" options. Our meals are made with fresh meats including chicken, turkey, fish, etc. What other dog boarding center in the Westport, CT of Fairfield. CT area will offer your pet that kind of service? While at our dog boarding center, your pet can also enjoy a mid afternoon snack consisting of Frosty Paws Canine Ice Cream and a biscuit. How about a Kong-o-licious? If your dog likes to chew, this peanut butter treat is great! We also carry Catnip Cocktails for your kitties. Call our dog boarding center today for more information. Visit Our Dog Kennel Today! Our pet and dog kennels are state-of-the-art! Each is nicely furnished with a comfortable couch, box of fun and amusing toys, soft music, a television, and its own private yard for every dog's comfort. Some special features of the pet and dog boarding facilities include ventilation and air conditioning systems in the Summer and heat in winter to keep your pet feeling comfortable and cozy all-year long. Our dog kennels make boarding your dog with us a stress free experience for both you and your pet in the Fairfield. CT area. We invite you to come in, take a tour, ask questions, and meet the staff anytime during business hours. There are several dog kennel options with personal flat screen televisions, soft music, toys, and more. All pets get to relax in spacious, climate controlled rooms, and are regularly taken out for walks. 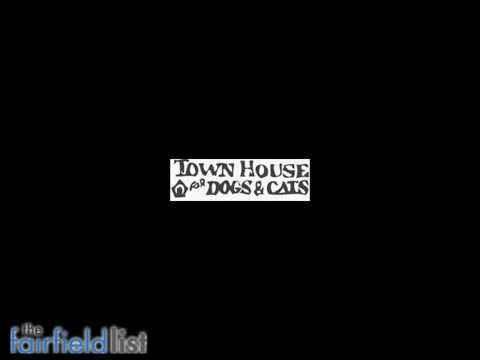 As the largest indoor/outdoor dog kennel in the Fairfield, CT and Westport, CT area, with adjoining sleep areas, Towne House For Dogs And Cats LLC strives to provides the finest in dog boarding. We offer playtime activities with canine counselors include Frisbee and freestyle play in addition to exercise. We also have a separate play area for cats with amenities that will keep them busy including, an amusing cat tree. Our doggie daycare/camp features outdoor play and exercise areas that area safe, stimulating, and fun. We can also provide socialization with other pets. Our facility believes cats deserve a va-CAT-ion. Bring your kitty in for bright and cheerful lodging in a Kitty Condo. Our Kitty Condo's provide soundproof rooms with litter pans and special sleep area. So what are waiting for? With our many amenities and care for your pet, you can rely on Towne House For Dogs And Cats LLC to give your best friend the best experience possible. Ask about our discounts, we offer specials for pet and dog boarding are available for multi-pets. Dog Grooming Keeps Your Pet Healthy. Choose Us for the Finest Dog Grooming & Boarding Services in the Area! When it comes to dog grooming and dog boarding services, it is good to know that you have the finest and most trustworthy in the Fairfield, CT; Westport, CT; and the surrounding areas! At Town House for Dogs & Cats, we strive to bring you the most comfortable dog kennel services as well as international and domestic, door-to-door pet relocation services. Don’t let just anyone watch your dog or cat. Leave your loyal companion under the secure, watchful eyes of Town House for Dogs & Cats. Pet boarding, pet grooming, pet kennel, family owned and operated, licensed, insured, luxury bungalow, private yard, special features, outdoor playtime, canine counselors, exercise, kitty condo, discounts available, experienced staff, all natural products, relocation services.